Throughout the Middle East region last week, instances of battles continued to decrease, dropping to their lowest levels of 2018 and 2019. Reported fatalities were likewise at their lowest for this period. This drop can be partly attributed to reduced fighting between Syrian Democratic Forces (QSD) and the Islamic State (IS) in the Deir-ez-Zor governorate of Syria. Demonstrations have also decreased slightly across the region, notably in Iran. Consistent with recent weeks, conflict in Palestine was most heavily clustered in the West Bank. Palestinians clashed with both Israeli security forces and settlers throughout the region, with the majority of events concentrated in Ramallah governorate. In Jenin, two Palestinians were reportedly shot, one fatally, after allegedly throwing an explosive at Israeli forces stationed at the Jalamah checkpoint. In the Gaza Strip, there were a number of peaceful demonstrations last week in addition to the regular Monday and Friday agitations against the blockade. During the weekly Great March of Return demonstrations along the border, two Palestinian youths were reportedly killed during clashes with Israeli security forces. At least 7,000 Gazans took part in the demonstrations (Jpost, 8 February 2019). In Israel, tensions were high on the southern border as Palestinian Islamic Jihad (PIJ), Hamas, and Israeli forces exchanged rocket and gunfire. Two rockets suspected to have been fired by PIJ hit open areas in Shaar HaNegev regional council, causing rocket sirens to sound in surrounding communities on 6 February. There were additionally two demonstrations in Jerusalem led by Haredim, one of which resulted in clashes with police. Tensions with Palestinian citizens of Israel rose in the north as residents of Qalansawe demonstrated against the impending demolition of seventeen homes. In the south, Al Araqeeb – a Bedouin village – was demolished for the 140th time (Ma’an News, 7 February 2019). In Lebanon, demonstrators held a sit-in protest in Sidon to demand the release of their family members who are part of the southern branch of the Islamic Community (Jamaa Islamia). In Tripoli, a demonstration was held against the economic situation and state corruption, while in Jezzine and EJ Jahliye residents demonstrated for increased environmental protections. Lebanese forces also closed multiple illegal crossing points between Syria and Lebanon, north of Bekaa. In Jordan, the weekly protest near the fourth circle was held once again last week as demonstrators demanded changes to economic policies and for better protections against state corruption. In Iran, protests by different labour groups, teachers, car buyers, and defrauded investors continued across the country, although at a reduced number when compared to previous weeks (for more information on recent mass protests in Iran, see this ACLED infographic). On 7 February, a large number of teachers held a demonstration in Isfahan voicing several demands, including better pay, the release of detained activist teachers, and an end to the diversion of water from the Zayenderud (river). Security forces used tear gas and pepper spray to disperse the protesters. Furthermore, there were several attacks last week by armed groups in the provinces of Lorestan, and Sistan and Baluchestan. In the latter, Jaish al-Adl (Army of Justice), a Baloch Sunni militant group, carried out an attack on a Basij force base in Nikshahr on 2 February. One paramilitary personnel was reportedly killed, and five more were injured. Earlier on 29 January 2019, the same group claimed responsibility for two bomb attacks in front of a police station in Zahedan. The first explosion was caused by a percussion grenade, while a suspicious package that was found on the street exploded before being neutralized, injuring three police officers. (US News, 29 January 2019). 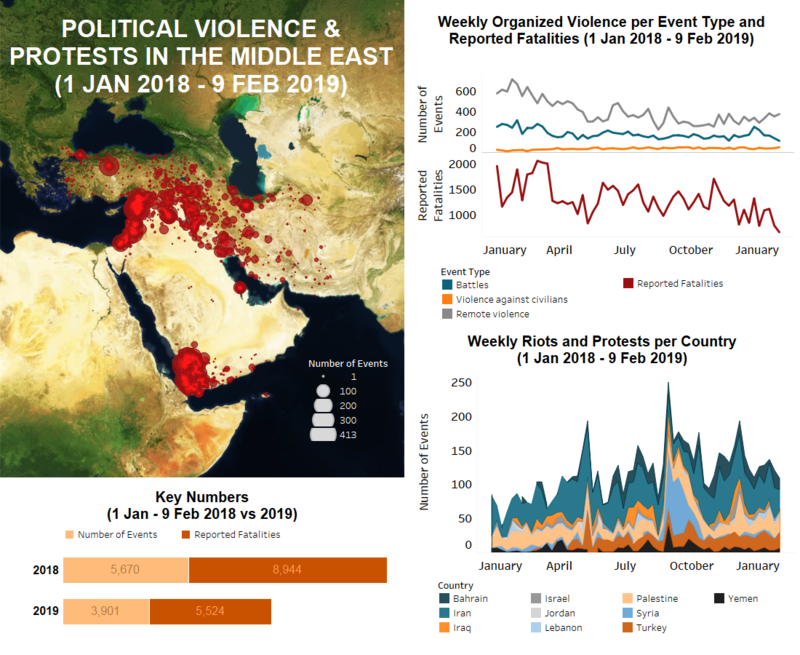 Meanwhile in Bahrain, several riots and protests took place over the week, mostly to commemorate the death anniversary of seven Shiite men who were killed during two separate incidents in February 2017 and 2018 while fleeing to Iran by boat. All men were fugitives, wanted for taking part in various anti-regime activities (Long War Journal, 28 February 2018). In Turkey, there were no reported clashes last week between Turkish security forces and Kurdistan Workers Party (PKK) fighters, although the group’s source alleged several Turkish airstrikes on PKK targets in the Mahir Mirzo, Selale, and Bircel areas of Cukurca district, Hakkari province. Turkish airstrikes were also reported in the Dahuk and Erbil governorates of northern Iraq, where PKK militants are known to operate. Meanwhile there was a large Peoples’ Democratic Party (HDP) rally in Bakirkoy Square of Istanbul against the continued maltreatment of political prisoners – including the leader of the PKK – in Turkish jails. Another rally led by the party in Ceylanpinar, Sanliurfa province, was dispersed by police when the local HDP mayoral candidate mentioned the PKK leader in a speech. In Iraq, IS militants were active in targeting members of the mostly-Shiite Popular Mobilization Forces (PMF), particularly in Baghdad province. The group employed several tactics, including IEDs and snipers. Meanwhile, a bus containing Iranian Shiite pilgrims was targeted by IS gunfire in Balad district of Sala al-Din governorate. They were returning from visiting the shrine of Seyid Mohammed, north of Baghdad (Kurdistan24, 3 February 2019). IS has carried out similar attacks on Shiite pilgrims in the past. Also prominent last week was the assassination of Iraqi novelist Alaa Mashzoub, which sparked at least two protests in Kerbala and Baghdad to demand that the perpetrators be brought to justice. Mashzoub had been critical in his writing about external intervention in Iraq, and there are suspicions that the Iran-backed PMF may have been involved in his killing (Washington Post, 6 February 2019). In Yemen last week, battles continued between pro-Houthi forces and Saudi-backed anti-Houthi soldiers in the northern governorates of Hajjah and Sadah. Anti-Houthi forces reported small territorial gains in Razih district of Sadah governorate, while Houthi forces claimed to have gained control of some areas in Hajjah. Furthermore, daily shelling continued within Hodeidah city, with occasional small arms clashes also occurring. In Al-Bayda governorate, fighting continued between Al Qaeda in the Arabian Peninsula (AQAP) and IS militants in Wald Rabi district, which consisted of clashes and targeted bombings. IS fighters likewise targeted Houthi forces in the same area, reportedly killing at least two soldiers. Clashes also continued for the second week between Hujur tribal fighters and Houthi soldiers in Kushar district of Hajjah, with the tribal fighters managing to thwart Houthi offensives due to heavy support from Saudi-led coalition airstrikes. In Syria, QSD forces backed by Global Coalition aircraft clashed with IS fighters in the group’s remaining territory of Deir-ez-Zor governorate, in the vicinity of Baghuz village. This comes following the collapse of negotiations between both sides which sought to provide IS fighters a safe passage to the Syrian desert. Several civilians were reportedly killed as they were attempting to flee the area. Meanwhile, regime forces exchanged shelling with Hayat Tahrir al Sham (HTS) and National Liberation Front militants in several locations in and along the DMZ in the Aleppo, Hama, Idleb and Lattakia governorates. Civilian fatalities were reported in both regime- and rebel-held territory. Lastly, there were several attacks on regime forces and their allies – including small arms firing and IED attacks – in Dar’a governorate. While it cannot be said with certainty, these attacks were likely perpetrated by the Dar’a Popular Resistance. It remains to be seen whether these incidents will continue and how the regime will retaliate.